All the global media attention and frenzy that greeted the birth of the British 'royal's' baby (despite the thousands of pressing issues and newsworthy stories at the time) ought to have served as an indicator that the Illuminati were trying to pass a message across to the world with his birth: Global focus means global agenda. William was the product of a loveless marriage. His Father Charles was originally interested in his current step mother Camilla Parker Bowles but when the relationship did not materialize, he settled for William's Mom's (Diana's) elder sister Lady Sarah. He had known Diana since November 1977 when he and Lady Sarah were dating, but he did not take serious interest in her as a bride until the summer of 1980. 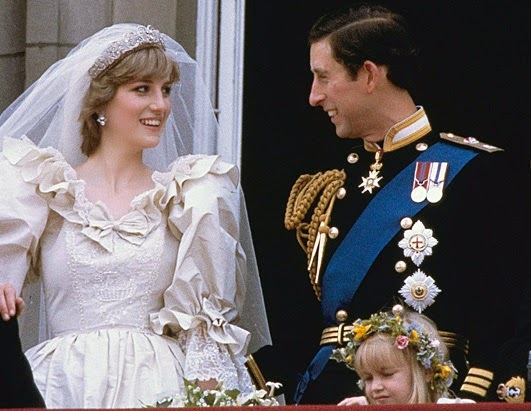 During their wedding ceremony in July 1981, she (Diana) 'accidentally' reversed the order of Charles's first two names saying "Philip Charles" instead of Charles Philip. As many of us already know, the marriage did not last due to Charles infidelity with his former lover Camilla Parker Bowles (Diana also had affairs during their marriage) and the affairs eventually led to their separation and divorce. Diana later died inside the Pont d' alma tunnel (lt Bridge of souls) in Paris France. Fourteen years after His Mum's death, William got married to Katherine and for their engagement, William gave Katherine His Mother's engagement ring. He said about his decision to give his fiancée his mother's ring, "It's very special to me. As Kate's very special to me now, it was right to put the two (Catherine and Diana) together" and two years and some few months after they got married, they both welcomed their 1st child into the world, a boy who they named George. "Symbolism is the language of the Mysteries; in fact it is the language not only of mysticism and philosophy but of all Nature, for every law and power active in universal procedure is manifested to the limited sense perceptions of man through the medium of symbol. Every form existing in the diversified sphere of being is symbolic of the divine activity by which it is produced....In a single figure a symbol may both reveal and conceal, for to the wise the subject of the symbol is obvious, while to the ignorant the figure remains inscrutable...."-.-Manly Hall. Alchemists perform 4 symbolic tasks in order to transmute their base 'lead' into incorruptible 'gold'. The 1st of these four tasks is called the creation of primordial matter. The creation of primordial matter symbolizes the creation of the female (mater, the mother/the white soul) in the flask (body of creation) and then marrying it (coniunctio) to the uncreated black (unrefined) spirit. Because of the imperfection of both of their natures, (He is unrefined, she is earthly, ignorant and fallen) both of them have to die, be refined and raised again to their ideal natures and that is why the next task of the alchemist seeking perfection (Gold) is the destruction (putrefaction) of primordial matter. The mater (mother, soul) has to be destroyed and raised again in order to attain her ideal state. Killing the matter (mater: mother) and retaining the Father (Spirit) would produce an imperfect offspring so the Father has to die as well and that is why the next task of the alchemist is called the Killing of the King. The King himself is unrefined so he too must die in order to be reborn to become his most ideal state i.e the Red king. "The Kabalists say that the true name of Satan is that of Jehovah placed upside down, for "Satan is not a black god but the negation of the white deity," or the light of Truth." Helena Blavatsky. Note that in Blavatsky's mind, Jehovah/god refers to the refined spirit (symbolized by William) and satan refers to the unrefined spirit (symbolized by Charles) She uses white to symbolize the purity of the Red Spirit. Diana and Charles during their wedding. Notice that Diana wears white and Charles wears black matching the alchemist's beliefs. Their loveless relationship symbolizes the unideal nature of their relationship and their subsequent separation and divorce symbolizes their need to separate because of their unideal relationship. Diana's death symbolizes the destruction of primordial matter. And that was the message that the Illuminati wanted to pass across to the World with Diana's engineered death with her Lover in the City of Lovers (Paris). Diana and her lover (who was another symbol of the black king) slept together in death in order to be raised again to their ascended and refined natures respectively and it is called 'sleep in death' because it is not intended that they remain 'dead' forever. Etymology of the name William: Will: Desire, which demonstrates that the 'resurrected' Charles acted from spirit will instead of ego will like his 'black' father and had thus developed desire for his wife and Helmet meaning that the desire he had developed was a protection against separation from her and their son. Princess Katherine (lt Gk Katharos: pure) who wore Princess Diana's engagement ring as her engagement ring (which was intended as a link between her and Diana) represents the awakened Diana, the ascended soul made 'perfect' and 'pure' hence her name Katharine: The 'pure' and 'ascended' soul. (Note that Katherine was a commoner before her marriage to William. It was her marriage to William that elevated her to a 'royal status' i.e she symbolizes the journey of the soul from ground state i.e the unrefined/fallen/single state to 'exalted' state i.e the 'heavenly'/'ascended'/married state. The spirit that occultists seek is the one that proceeds from inside the soul, not the one that proceeds from outside the soul. i.e the one that proceeds from inside the true God, Jesus Christ. But Diana, the representation of the soul died to her lower self (earthly nature, ignorant state) in order to be raised anew (acquiring a new nature) and that is why the renewed Diana is represented as someone who did not proceed from inside her body i.e Katherine. The new child represents the product of the union between the 'perfected' and 'ascended' soul (female) and the 'refined' spirit (male) ruling in the hearts of men. i.e perfected prima materia ruling in the terrestrial (earthly) realm An ideal marriage is a marriage were two different people become one so the child symbolizes the union of the refined spirit and the ascended soul in order to produce the 'perfect' and 'divine' being, the christ /god consciousness (man in satan, the god of this world's image) dreamed of by all occultists. Alchemists refer to the child as the golden child or the philosophers stone. i.e the golden child/stone born in their hearts and that is why the baby was named George (lt. Gk Georgos meaning farmer, earthworker ge: earth, ergon work.) The son is the reward of the alchemist/ initiate (terrestrial/earthly man) who works to change the lead in his heart into gold hence the announcement of the baby's name 50 symbolic hours after his birth . The Patron 'saint' of England is St George and his emblem, a red cross on a white background, is the flag of England, and part of the British flag. He is often depicted as killing a dragon in order to rescue a beautiful lady: The dragon stands for evil : the dark and unrefined spirit that restrains the souls 'purity' from manifesting i.e the old nature of the ignorant soul. The lady is said to symbolize truth. i.e the refined and awakened soul (the soul that has realized its so called 'true' nature) That is why St. George is often depicted as a brave martyr who was victorious over evil. 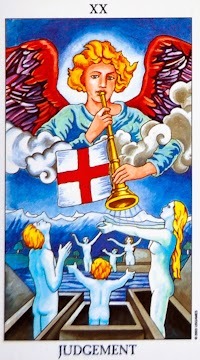 The 20th Tarot Card, the Judgment card. Notice that the emblem of George is on the trumpet of the so called angel. The angel represents the son of perdition who spreads the message of 'truth' (the message of the unity of spirit and soul) in order to awaken ignorant souls from their slumber and thus slay the symbolic dragon. All those who heed the call awaken from their slumber of ignorance and look up (to the spirit) i.e strip themselves of their ego identity in order to take on the spirit identity. Also take note of the fact that his emblem consists of a red cross on a white emblem, the colors of the 'refined' spirit and the 'pure' soul. 1.During Katherine's pregnancy, she had bouts of a rare form of severe morning sickness associated with women expecting twins and this prompted some media organizations to conclude that she was expecting twins, but as we all know, there was only one child in the womb at the time. 3. She gave birth to her 1st child (i.e number 1 in hierarchy) George on the same day that Penelope Cruz gave birth to her 2nd child, (i.e number 2 in hierarchy) a girl named after the roman goddess of the moon, Luna . Penelope kept her pregnancy and birth of her daughter so low-key that as at the time of writing this, there has been no public sighting or picture of her baby yet, unlike George who received worldwide attention during and after his birth. 4. Selena Gomez (Selena is derived from Selene, the Moon goddess in Greek Mythology) also shares the same birthday with the baby. 5. The current Queen of England and mother of Charles, Elizabeth the 2nd made the following statement shortly before the baby was born: "The Baby needs to hurry up because I would like to take my vacation"
1.The rare twin syndrome that Kate suffered from when she was pregnant for George was designed to reflect the fact that her offspring is a dyad of herself (soul, moon) and her husband. (spirit, sun) i.e her child is the 'pure soul' fully reflecting the light of the refined spirit: A female made in man's image. 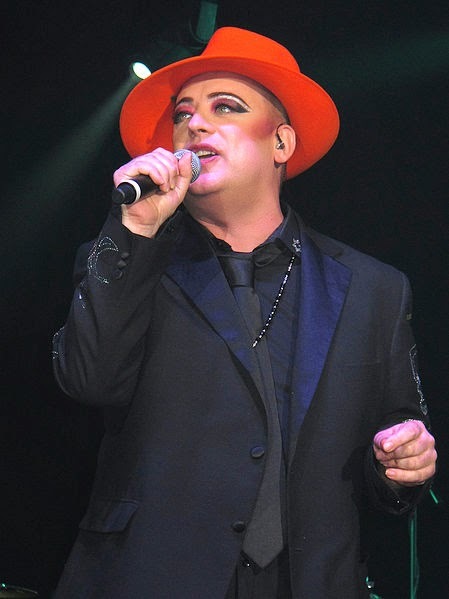 (Remember Boy George, the British singer with an androgynous appearance? 2. The Full Moon signifies the peak of the Soul's enlightenment. As many of us already know, the moon represents the soul or the mother because it is a receptacle of the light of the sun (the same way the woman is a receptacle of the life (sperm) of the man). 3. The birth of Luna on the same day as George as well as Selena Gomez birthday falling on the same day he was born signifies the birth of the submissive/passive twin of the dyad. The 'pure soul' reflects the light of the sun and has no light of her own. George is the active/dominant principle. He is the sun that gives light to Luna (the moon) and rules over it. She now reflects the light of her husband to the world and therefore the darkness of her former nature is concealed by the light of her husband. i.e she veils her nature in order to reflect her husband's nature. 5. Katherine gave birth to a single child despite the rare twin syndrome that she had when she was pregnant for George. This was designed to drive home the fact the 'pure soul' gives birth to twins: One visible and dominant who represents George, the other invisible and submissive who represents Luna. i.e the combination of their two conflicting natures results in a unified whole. The visible part i.e the sun (the Red Father) and the invisible/submissive part i.e the moon/Luna (the white Mother) and that is why the baby Luna's birth was low key i.e the baby Luna (the symbol of the moon ) becomes submissive in George (the symbol of the sun) so Luna is the ideal queen of the work because total submission i.e obedience to the 'sun' is attained in her. 8. The Queen's statement about taking a 'vacation' (the word vacation comes from vacate which means to leave a place or position) after the baby was born symbolizes the end of the old aeon (rule, era) and the beginning of a new one. As some of you who are spiritual minded already know, the luciferian mind likes to program outer (physical) events to go in line with inner (spiritual) events but in line with being careful and trying to be 100% accurate, I wouldn't want us to hastily jump to any definite conclusion based on our understanding of inner events (events happening in the spiritual realm which the physical events happening in our world today mirror) so I would simply say that there is a possibility that the Illuminati would engineer her downfall (either by death or forced abdication) very soon and since Charles is the black (un-ideal) King, it is highly likely that he would use the excuse of being too old to become King in order to pave the way for the ideal King, William. Another possible scenario is that Charles would become King for a 'short time' and then hand over to William. Katherine was born on January 9th 1982 under the satanic sign of Capricorn the goat and her son was born on July 22nd 2013 under the satanic sign of Cancer, the crab. Her husband was born on July 21st 1982, under the satanic sign of Gemini, the twins. Capricorn is ruled by saturn, Cancer is ruled by the moon (remember the full moon at his birth) while Gemini is ruled by Mercury. Cancer symbolizes the balance of the two as one i.e the full moon (female) perfectly reflecting the sun (male). Crabs are known to retreat into their shells if it suits their moods. This concealing of themselves in their shells perfectly reflects the the awakened soul. She conceals herself in order to reveal the light of her husband. Notice that the symbolic elevation of the goddess to the sun occurs on July 4th, a few days before July the 22nd and July 4th is under the same sign (cancer) as July 22nd. Also notice that Isis (the mother) hides herself until her son's birth. I.e she reveals herself (i.e her satanic realized self) as her son (the product of the union between Sirius, the spiritual sun and the physical sun). Also notice the statement " two are known and one comes forth in all her glory"? Who do you think the two known ones (stars) and the one unknown that "comes forth" in all her glory are? Christ the Son of God is about to be born in the hearts of His Faithful ones. Do not be caught sleeping. Wake up and partake in His birth. Mystics believe that the more the spirit unfolds in the soul (evolution), the more it would become refined and the higher it would ascend and the Higher the soul's ascension, the more it's latent purity would become evident. This belief is totally opposed to Christianity which teaches that our souls are rebellious and impure and that the spirit within us is accursed (Gen 3:14, Isa 64:6, Rom 7:18) and that is why Christianity is centered on the only person who is good and upright : Jesus Christ (Acts 4:12) and the more our souls reject the accursed spirit within us and submits to His Spirit, the more He conforms our vile and corruptible nature into His righteous and glorious nature (Phil 3:21). Note that Diana was the Princess of Wales= wails i.e the one that people wailed for. Katherine is the Duchess of Cambridge = Came Bridge = the Bridge who came i.e the 'ascended goddess/perfected soul who descended from her ascended state into material vessels in order to 'perfect' humanity by bridging them with the spirit (serving as a middleman hence her maiden name Middleton= middle stone= perfected stone='perfected' heart (heart perfected by love: the heart is the center (middle) of the body). Note that Diana died inside the Pont D'Alma Tunnel: ”Pont” means “bridge” and “Alma” means “soul” i.e “Bridge of the Soul. Diana was a symbol of the earthly and fallen soul bridge that had to die in order to become conscious of the light of Spirit in order to ascend to its 'heavenly' state. Katherine is a symbol of the ascended and 'heavenly' 'soul bridge' that came down again in order to bridge humanity with the satanic spirit.